Voters hear from Gov. Janet Mills, whose hometown is Farmington, on why she supports the controversial project. FARMINGTON — Residents Monday voted overwhelmingly to oppose a proposed 145-mile transmission line through western Maine following a debate that included comments from Gov. Janet Mills on her support of the project. 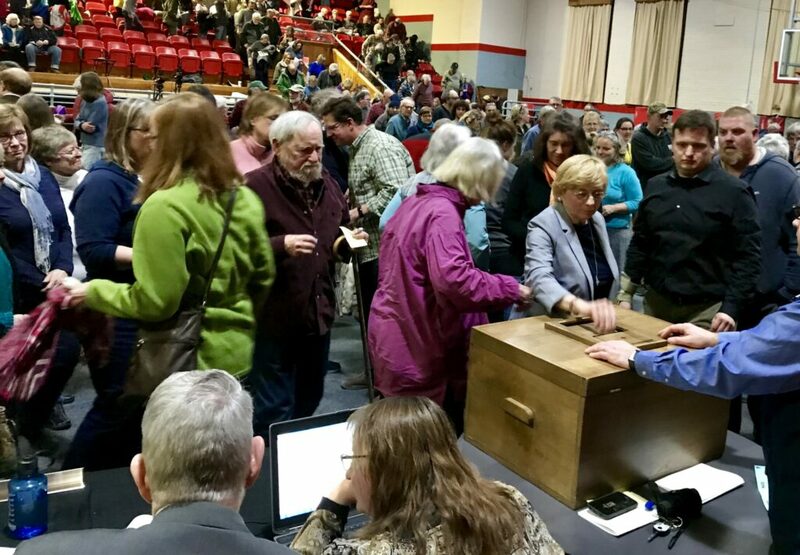 The vote was 262- 102 to oppose the New England Clean Energy Connect project in a secret ballot vote at the annual Town Meeting at the Farmington Community Center. During about 45 minutes of debate, Mills, whose hometown is Farmington, said she supports the project because it will provide $346 million in electricity market benefits in Maine in the first 15 years and will reduce CO2 emissions by about 360 metric tons per year. She also cited the local benefits, including an estimated $436,000 in new annual tax revenue from the project in Farmington, $5 million from Central Maine Power to economic development in Franklin County and $5 million in scholarships for local students. In addition, Mills cited the support of groups such as the Acadia Foundation and Conservation Law Center who have signed on to supporting the project. She said hydropower is one of the cleanest forms of energy; that the power would be coming from Canada, a country that is still a part of the Paris Agreement on climate change and has an interest in reducing emissions; and that the hyropower line will help bring down electricity prices throughout the region, including in Farmington. Prior to her speaking, some residents said they were against the line because of its impact to the environment in Franklin County. Resident Dennis O’Neil said he supports the CMP line because it’s a step towards less reliance on fossil fuels. The vote rescinds a letter of support the Board of Selectmen previously wrote in support of the project and authorizes them to submit to the Maine Public Utilities Commission, one of the permitting agencies for the project, a letter opposing it. In other news Monday, residents also voted to approve an ordinance putting in place regulations for marijuana related businesses and approved an overall $6.1 million municipal budget. A statement encouraging Franklin County commissioners to reverse their policy aimed at eliminating county funding for nonprofit social services was also approved, as was $17,998 in funding for such services, including groups like Western Maine Community Action and Western Maine Transportation. Lately, she said the group has had to cut back on their bus routes due to budgetary constraints. “We hear a lot about these cuts in the national news and it’s really sad to sit here in this town and hear the same thing,” Widmer said. In elections, Selectman Josh Bell, who currently serves as the chair of the board, was re-elected with 130 votes. Selectman Michael Fogg was also re-elected with 170 votes. Both are three-year terms. Isaac Raymond was elected to a three-year term with 92 votes. Dennis O’Neil was elected to a two-year term on the RSU 9 board of directors with 149 votes.